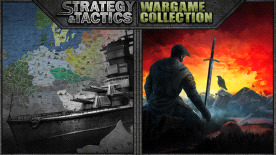 Strategy & Tactics: The Wargame Collection is a turn-based strategy game that unites three great best-sellers into one title. Gamers get a chance to immerse themselves in the world of medieval wars, fight in World War II against the Allied forces or the Axis Powers, and also write their own history, becoming leaders of their countries. multiplayer hot seat mode and online game.